Harness the power of Artificial intelligence to grow any plants you want. No green thumbs required. Just pop in a pod, and let Herbot take care of the rest. The Herbot App not only makes gardening more accessible and engaging, it makes Herbot a truly intelligent, fun-to-use product. To make getting started easy, you can choose from our tested plant-growing algorithms or build your own recipe to experiment. 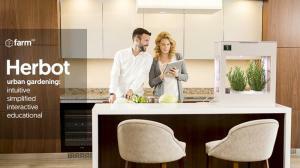 BELLEVUE, WA, UNITED STATES, April 6, 2018 /EINPresswire.com/ — The future of in-home gardening is here. Recently launched on Kickstarter by farm 4.0, Herbot is a line of indoor robots that automate the process of home gardening and empower the next generation of urban farmers through affordable and sustainable organic agriculture. 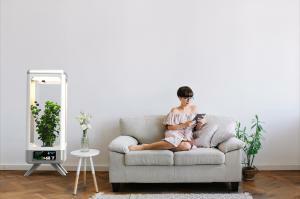 With Herbot, anyone can grow anything, anywhere, anytime. It's as simple as that. 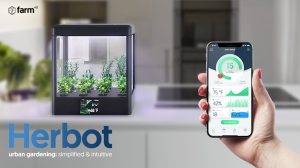 Using precise sensors, climate-control technology, advanced hydroponics and intelligent growing algorithms, Herbot automates the process of growing fresh produce, medicinal herbs and flowers with the ease of pressing a button. Each Herbot device leverages Artificial Intelligence to automate the plant cultivation process from seed to harvest. "With Herbot's automatic gardening capabilities, we hope to help those who might never have grown food before by giving them the resources and confidence to become urban farmers and join the growing movement for all-natural, hyper-local food," said Talha Sabri, CEO, farm 4.0. Getting started with Herbot is easy. All you have to do is plug in the preseeded net pods, insert the nutrient solution, add some water to the hydroponic reservoir and select a plant algorithm using the simple-to-use, educational companion app: Herbot OS. "We wanted our product to be as interactive as possible, making home gardening not only hassle-free but also engaging, fun, and educational," said farm 4.0 COO Misha Savvateev. Three variations of Herbot are currently being made available via Kickstarter: the compact and affordable Herbot Mini, the sophisticated and high-precision Herbot Pro and Herbot Grande, with advanced growing technologies and an elongated growing space. Herbot's proprietary DIY "Seedling" Kits enable anyone with the desire to build their own automated hydroponic growing system to customize their device to meet the specifications they desire, leveraging pre-designed sensors, electronics and schematics. For more information about Herbot please visit our website, our page on Kickstarter, or the company Instagram. farm 4.0 is а socio-technological enterprise striving to make agri-tech innovation affordable for underserved consumer segments, while also contributing to high-impact social-welfare projects around the world. "farm 4.0's first venture, Herbot, is more than just a line of products, but the first step towards developing the technology, network and infrastructure necessary to scale to larger solutions in automated agriculture," said Ben Keller, Chief Global Development Officer, farm 4.0. The farm 4.0 team is currently developing shipping-container-turned-IoT-climate-controlled-farms at the Global Innovation Exchange and is in talks about a potential partnership with innovative technology companies in Seattle including Microsoft to ship them to areas across the Middle East, Africa and Asia, which are affected by malnutrition and where conventional farming methods are impractical due to climate change and water shortages.